Mugato (Item No. 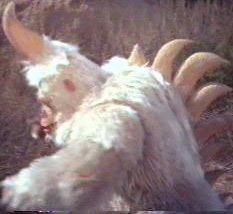 51204/4), a “Creature of the Week” from the Classic “Star Trek” episode “A Private Little War.” The Mugato, a beast indigenous to the planet Neural, is a savage and carnivorous simian, with white fur, a large cranial horn, and poisonous fangs. It is a senseless, barbaric ape, cultureless and without motivation beyond basic instinct. 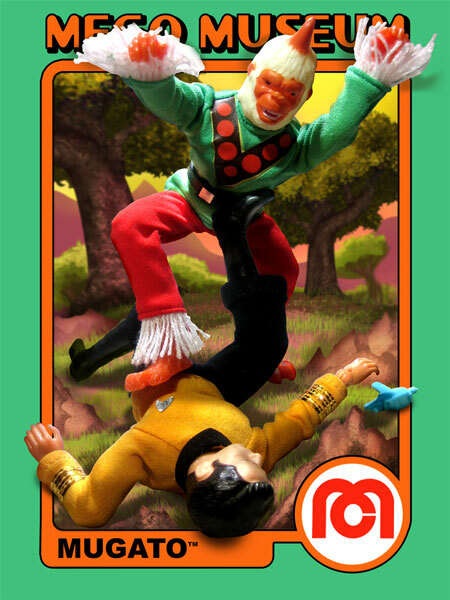 So, naturally, Mego outfitted their Mugato figure in a belted dashiki and red slacks.. 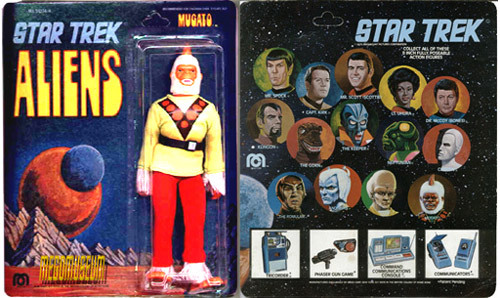 In a marketing decision that may have been influenced by the success of the Planet of the Apes line, Mego clothed their Mugato figure. And not just in any clothes–bright, day-glow double-knit polyester duds. This choice is not only just plain chromatically insulting, but culturally anachronistic as well. The Neuralians are barely above the hunter-gatherer stage, still adorning themselves with animal hides. Taking this into consideration, I refuse to believe that the Mugato–beast-like and primitive–roams the hills of Neural in one of Huggy Bear’s rejects. The Mugato figure’s head is actually a pretty passable sculpt. However, it looks as if the sculptor never saw any pictures of the creature itself, and instead modeled his work on a basic description of the Mugato. Paramount did not provide Mego with much by the way of a styleguide, merely photographs and episode reels, Mego may have had to improvise the rest. I know that if somebody called me on the phone and said, “I need the head of a white-furred ape with a horn,” this is probably what I would have come up with, too. The face is incorrectly-painted in a bright orange, so, naturally, the choice of body was an extension of this feature. The body was cast in a unique, bright-orange color, and was given orange Ape hands and a pair of unique, oversized gorilla feet. The investment of time and money spent on these feet–at the expense of the rest of the figure–boggles the mind. Perhaps Mego decided to start at the bottom and work their way up, and, only after the feet were completed, realized that they had already blown their whole Mugato R&D budget. *The horn almost always has at least one rub near the tip (Green Goblin owners can relate…). 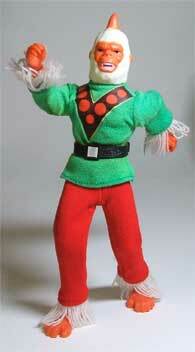 *The knee pins are excessively weak, and it is not unusual to find Mugatos–even MOC–with broken legs. *The heat-sealed “V” on the shirt often splits at the middle. *The green shirt suffers from the same green-to-yellow fade common to Green Arrow’s bodysuit and the sleeves and undies of Removable-Mask Robin. Despite these many flaws and inaccuracies, the Mugato has a goofy charm to it and no collection is complete without him. Above is not a common site, the carded Mugato which only came on this version of card. Mugato’s belt is unique to the character and has been factory reproduced by both Doctor Mego / EMCE Toys and Classic TV Toys, however, neither reproduction features the sticker on the original’s belt buckle. The original belt has a white square sticker that has a vertical gradiated blue line in the center. The Doc Mego / EMCE reproduction belt has a slightly duller texture than the original and is marked DM on the backside. The CTVT has a sharper texture than the original and is marked CTV in the inside. 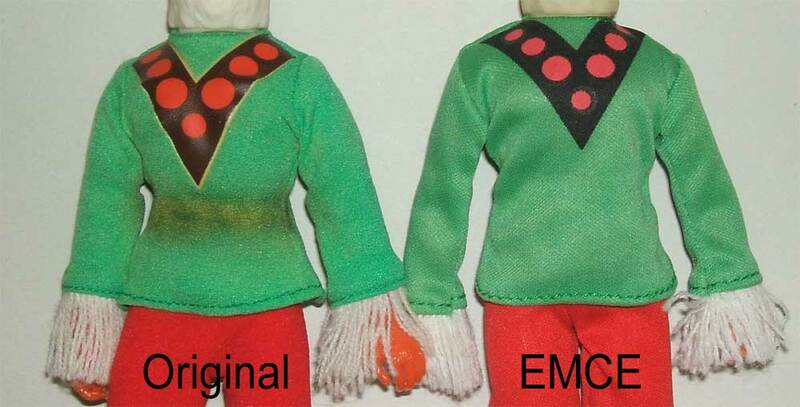 Mugato’s shirt has been factory reproduced by EMCE Toys. The reproduction is a near perfect color match to the original, but is made with a more modern slicker material. The big difference is the V design on the chest. The original is a vinyl heat sealed style, while the reproduction is printed right on the material, making the black area more black. The reproduction is also missing the yellow border that surrounds the V shape. Another dead giveaway is the missing black stain which occurs with most original Mugato shirts due to the black belt. The reproduction is unmarked. 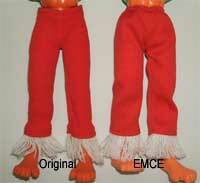 Mugato’s have been reproduced by EMCE Toys. Like the shirt, the repro pants area near perfect color match. The only real giveaway is the more modern slicker material they are made from. They also fit a bit looser. The reproduction is unmarked. While not really an accessory, Mugato’s feet are unique to the character. 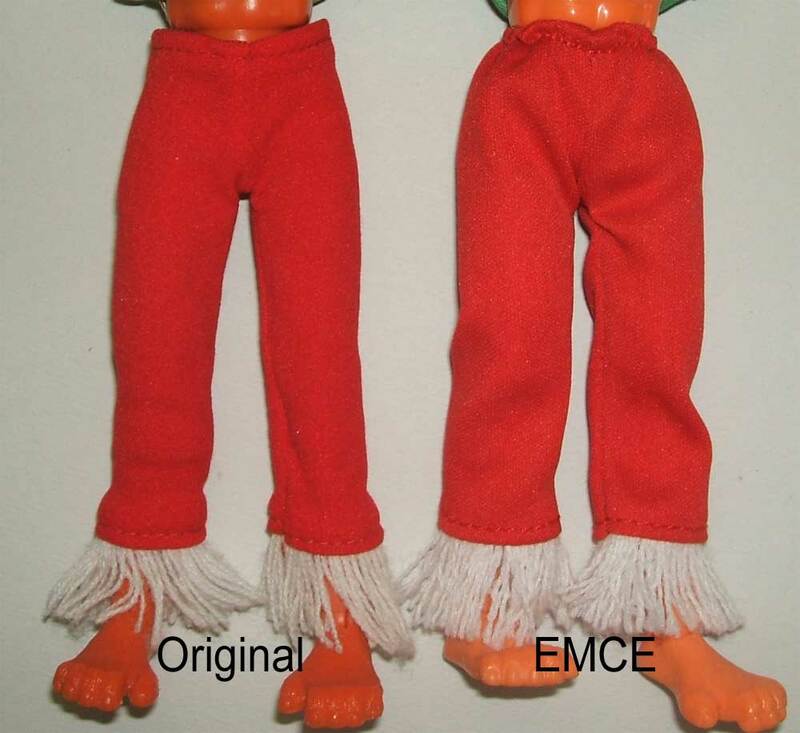 And though it’s part of the body, it should still be noted that they have been factory reproduced by EMCE Toys. The reproduction feet are identical from a molding perspective. There are only 2 differences. The reproduction is a lighter orange (as is the entire repro Mugato body) than an original Mugato, and the joints pin hole is larger on the reproduction. The repro is unmarked. 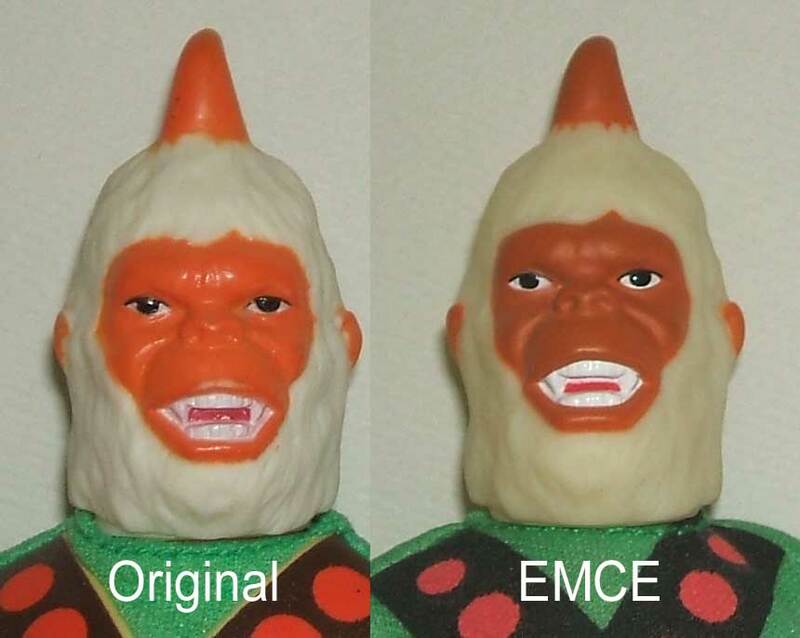 Mugato’s head as been factory reproduced by EMCE Toys. The reproduction is a little larger from tip of nose to back of head, but otherwise pretty accurate in size. The details on the reproduction are a little more dull, most noticably in the hair, which is also not as bright white as an original. The face, ears and horn on the EMCE version are also darker, with a little more brown in the orange color mix. The repro is marked with the 2008 CBS copyright on the back of the neck.